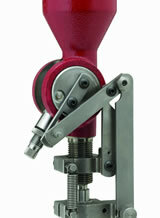 Hornady offer a wide selection of powder measures & powder handling tools to make reloading accurate, safe & simple. 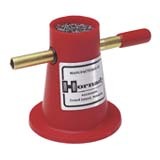 Hornady reloading equipment at at great UK price! Designed specifically for use with the new and improved Case Activated Powder Drop, this accessory makes changing over your LNL-AP faster and easier than ever! It allows you to preset dies for the quickest caliber conversion on the market. Includes lower bracket with guide bushing and lock ring. Our new Powder Through Expanders work great with the Quick Change Powder Die. *Note: This product will work only with the New Case Activated Powder Drop, part #050073. The incredibly strong Fast-Load Powder Measure Stand has a rigid frame and extra long arm that lets you fill an entire 50-count Universal Loading Block. Accepts any measure with 7/8"-14 thread. Lock-N-Load Bushings: If you have more than one powder measure, you can switch them in and out of the Fast-Load stand in just seconds, using Lock-N-Load bushings. Long Reach: Lets you bench-mount the powder measure and still drop powder in the loading block. Install on your progressive press after the powder drop station to automatically check dropped charges (a smart practice, often ignored). Hornady uses a similar device on our own ammo manufacturing presses. It won’t replace careful attention, but helps monitor the reloading process. Works with all powder types and calibers. The Lock-N-Load® powder measure offers the most flexible operation and the widest range of any powder measure. It ranges from .5 - 265 grains of powder (special metering inserts and rotor required). Metering inserts can be changed with the push of a button. Comes with standard rotor and metering insert. Go from .5 grain to 265 grains by simply changing rotor and inserts. Use one Lock-N-Load® Powder Measure for reloading everything from small pistol cartridges to large magnum rifle cartridges. To change metering inserts, just push the Lock-N-Load® insert release button and insert another metering insert. Simply verify the new charge and you're reloading again right away. Inserts can be swapped in seconds. Go from reloading 30-06 to 45 Auto in no time. Keep the preset inserts with your die sets. With only .002" clearance between the drum and rotor, it's the tightest in the industry for a standard measure. 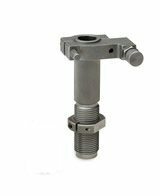 This tight tolerance helps eliminate powder binding between the frame and drum, delivering smooth function with all types of propellant–extruded or ball. Mount to your bench using a standard mounting bracket and lock ring, or use our Lock-N-Load® bushings to mount this versatile measure on the Fast Load Powder Measure Stand or on the Lock-N-Load® AP™ with case activated powder drop for automatic powder measuring during reloading. The O-ring on the metering insert adjustment lets you put a slight amount of tension on the metering unit to make fine, incremental adjustments. Once you've set your charge, tighten the lock ring to secure the setting. For handloaders who want “hands-on” accurate control of their powder charges, the Lock-N-Load Quick Trickle provides an excellent way to deliver an initial large volume powder charge with the ability to finish with small precision metering for perfection. 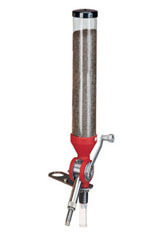 This versatile powder trickler features hand operated high and low speeds with up to a three-to-one gear ratio. Combined with double-sided, sealed ball bearings that prevent stray powder from impeding operation, the Quick Trickle is the smoothest operating powder dispensing tool for your reloading bench. Hornady’s all-metal Blackpowder Powder Measure features a non-sparking aluminium hopper and brass metering unit. Designed specifically to meet the safety needs of handloaders working with blackpowder. Hornady’s Bench Rest Powder Measure gives you all the advantages of Lock-N-Load technology with the added benefit of more precise measuring. That precision comes from a specially designed metering insert and a smaller metering chamber to promote more consistent and uniform filling. The micrometer adjustment gives positive reference for metering adjustments and you can install pre-set metering units by simply pushing the button on the outside of the metering chamber. There’s no need to drain your powder hopper or disassemble the Powder Measure. Simply use the Drain Tube Insert (sold separately) to rapidly and easily return powder to its container. Measurements adjust from 20 to 65 grains. All moving parts have been plated for protection and long life, and the rotor requires NO lubrication. A must-have for filling weighed charges, checking weights and returning powder to the case. 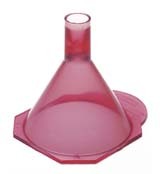 Anti-static funnel fits all calibers between 22 and 45. Squared design won’t roll off table. Fits on the end of Hornady’s funnel for the small 17 and the new 20 caliber necks. Also fits MTM and others. With a wealth of information for reloaders, this latest edition of the Hornady reloading manual includes more calibers, more powders & more data then ever before. 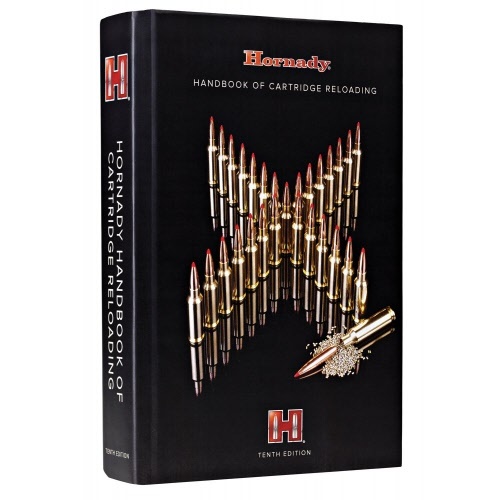 Reloaders will find the 9th Edition Hornady® Handbook of Cartridge Reloading an invaluable resource for their bench. You'll find over 900 pages representing data of all the newest Hornady® bullets like the NTX®, GMX® and FTX®, plus longtime favorites like the V-MAX™, SST®, InterBond®, InterLock®, A-MAX®, XTP® and more. Each cartridge features applicable Hornady® bullets along with velocity/powder charts for quick and easy reference. Cartridge additions include the 17 Hornet, 327 Federal, 356 Winchester, 5.56 NATO, 416 Barrett and 505 Gibbs. There is also expanded data on over 20 favorites like the 223 Rem, 300 Whisper, 308 Win, 25-06 and many more. A variety of propellants such as Power Pro Varmint, AR-Comp, CFE-223, among others have been added to many popular cartridges. In addition to the comprehensive reloading charts, this reference manual provides shooting enthusiasts with in-depth, easy-to-understand explanations of internal, external and terminal ballistics. Coupled with the Hornady® online calculator, shooters will have the tools they need to replicate the environment where they plan to shoot. Whether a novice or seasoned reloader, these resources provide everything needed to successfully reload your favorite cartridges. Speed and efficiency save time and money. With the introduction of the Hornady® Lock-N-Load™ Auto Charge™ Powder Dispenser, we have combined both in one extremely accurate system. This unit is quick to setup, easy to use, and exceptionally precise to within 0.1 grains, and has a scale capacity of 1000 grains – and designed to be much easier to use than the competition. 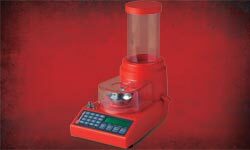 An easy-to-use keypad coupled with a large, easy-to-read backlit display, automatic & manual dispense options, trickle function, three speed settings, overcharge protection, and easy clean out make this the single most effective powder measure on the market. When it comes to the competitors, there aren’t any who measure up! The new and improved Case Activated Powder Drop has been re-engineered with quick change-overs in mind. The retainer spring has been re-engineered for smoother function than previous models and the powder drop only dispenses a powder charge when a case is present. 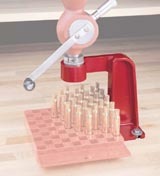 Works with the Lock-N-Load AP or other progressive presses that use 7/8" - 14 threads. Powder Through Expanders (PTX) are designed to work in conjunction with the Case Activated Powder Drop. 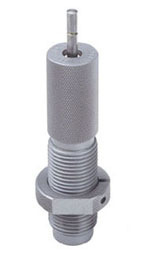 The new expanders eliminate the need for a seperate case mouth expander die on the LNL-AP progressive press, freeing up an extra station for a taper crimp die or powder cop. The Hornady Lock-N-Load Handgun Metering Assembly is the perfect tool for the reloader looking to improve the function of their Hornady Lock-N-Load Powder Measure. The Handgun Metering Assembly features an adjustment lock ring, which allows settings to be locked in place permanently for a favorite load. The assembly is designed to throw charges of pistol powders between 0.5 to 17 grains. Use with the Lock-N-Load® Bench Rest Powder Measure. 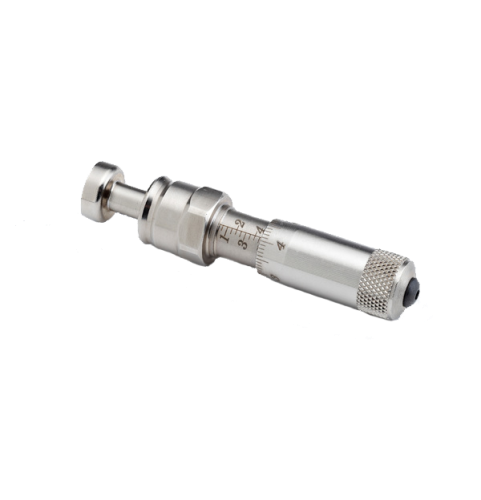 The micrometer insert allows the user to make and monitor incremental changes and return to previous settings. 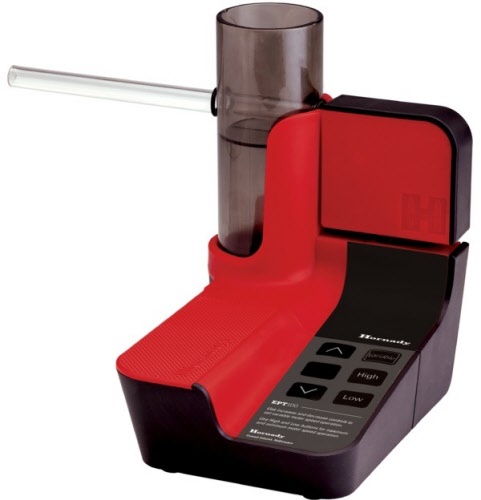 Load up to 265 grains of powder in a single drop with Hornady’s High Capacity Metering Kit. 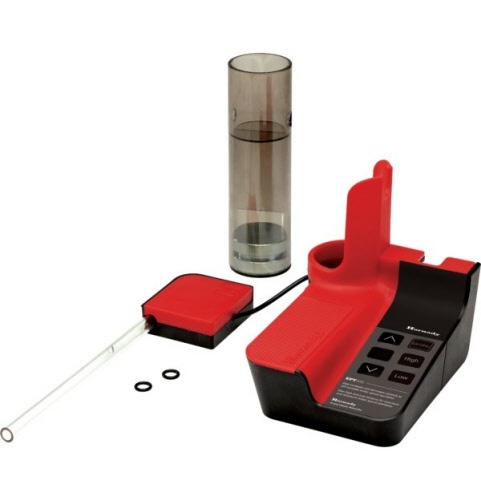 The kit’s two metering units have capacities of 80 to 180 grains and 165 to 265 grains of powder, and come with the clear drop tube and large hopper tube. The clear drop tube visually ensures a complete powder drop. An extended hopper tube is also included so you can reload more rounds between refills of powder. 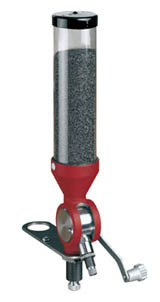 Fits Hornady Lock-N-Load Powder Measure. Includes an over-sized hopper tube, 265 grain capacity metering unit and a see-through extended drop tube so you can confirm a complete powder drop into the case. For use in your L-N-L Powder Measure, this pistol rotor features a smaller chamber for more precise metering of charge weights between .5 and 17 gr. For extremely precise measurements, the Micrometer Pistol Insert allows you to make and monitor incremental changes and return to previous settings. *In order to use this insert, you must have the Pistol Rotor and Standard Metering Insert, Item #050128. The same baffles as included with the 366 Auto. Prevents powder and shot from compacting or clogging. PACKAGE INCLUDES TWO BAFFLES. 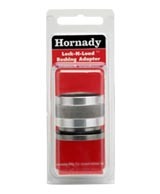 Hornady powder bushings are identified by numbers that correspond to the size of their inside diameter. (For instance, the inside diameter of the #456 bushing is .456 inches.) Bushings for powder charges in half-grain increments can be calculated from this chart. Simply “split the difference” between the two even grain bushings, and select the bushing nearest the result. Example: To find the bushing for 18½ grains of Hercules Red Dot powder, note that bushing #468 gives a charge of 18 grains and that bushing #480 gives 19 grains. Split the difference between 468 and 480, and the result is 474. Thus, the correct bushing for 18½ grains of Red Dot is bushing #474. IMPORTANT: Due to agitation of powder during the loading operation, different models of loaders require different bushings. Therefore, the above chart should be used only for 366 Auto™ and Hornady’s APEX.™ Additional charts are published for other Hornady loaders. All charges listed on this chart are an average of several loads that were weighed following the complete reloading cycle. Powders used in establishing these loads were from samples supplied by the manufacturer. Charges may vary slightly due to operator’s technique and/or powder variables.